Should we write about who is Aziz Al Mudhaf ? 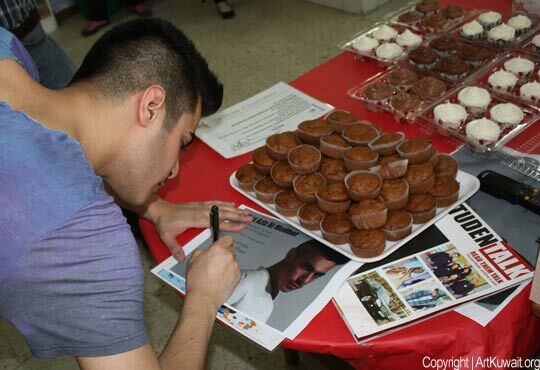 Since he became an emerging star in Kuwait, everybody knows about him and his fan club is growing up. But for our readers from around the globe we include some biographical notes. Aziz Al Mudhaf, 20 years old, born in Kuwait. 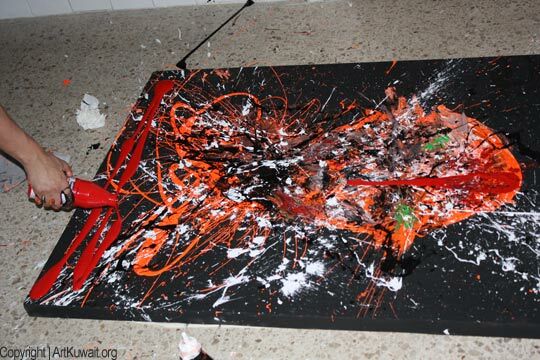 Start to paint at the early age and during his artistic formation started from realistic and hyper- realistic style at the present day discovered his own style in the abstract expression. Held different exhibitions and participated in the group exhibition at Opera Gallery in Dubai. 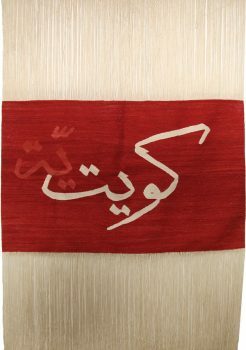 At the 2nd Contemporary Art Auction organized by Lulu Al Sabah 9th of February, 2011 his painting was sold over estimate. 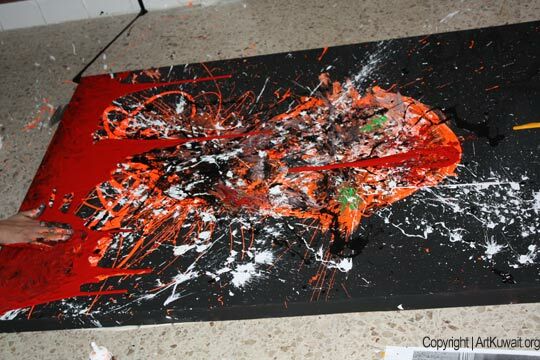 Favorite artists of Aziz are Francis Bakon and Jackson Pollock. it was A sensational afternoon! 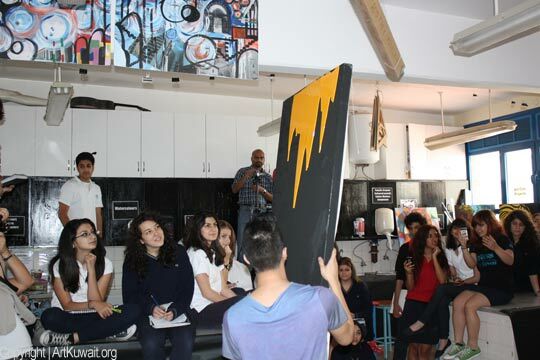 thanks Artkuwait for documenting this event and exposing Art at AIS. unforgettable!!! Wednesday 23 March 2011 was an unforgetable afternoon. 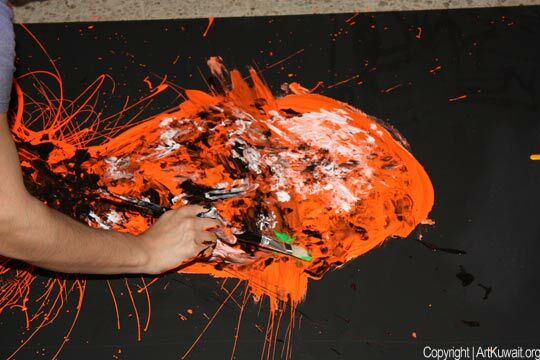 Having a talented artist like Aziz Al-Mudhaf attend our school is a pleasure and a dream come true. The best advice that you gave us which is still in my mind, is to be myself and to create artworks with my likings and not what people would expect from me. Also, I still cant believe that Aziz Al-Mudhaf painted a canvas before my eyes. 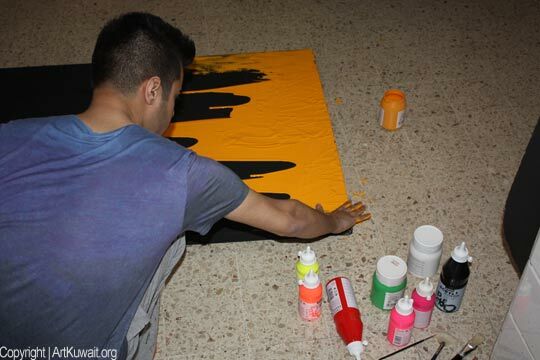 When he started painting with his hands, it seemed like he gave a new meaning to modern art emphasizing that it is important to feel what you are painting to truly call it ART! 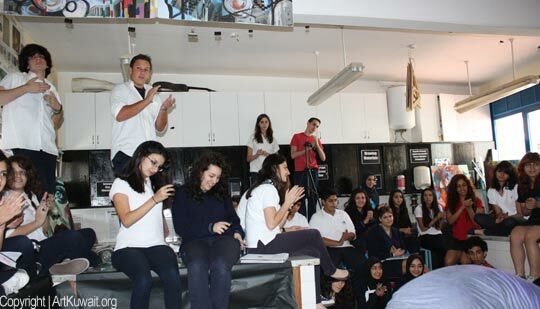 Having Aziz AlMudhaf at our school was a wonderful experience. I have learnt so much about art and paint. It was a great pleasure because i learnt that nothing should stop you from creating art and that you should always experiment with the supplies. You should not just use the media properly, you can use it however you like the way you get comfortable with it. 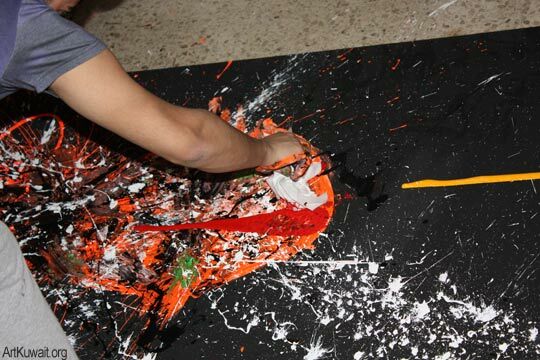 I have enjoyed the whole session and i was really interested because he works on top of the artwork using his hands. I really hope we can get the chance to meet him again. Aziz Al-Mudhaf was a true inspiration to not only me, but to all of us. 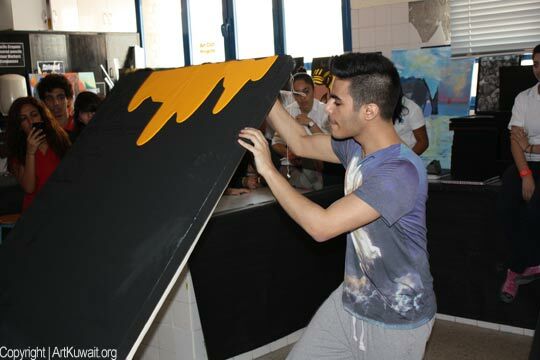 I really enjoyed his visit to our school, he taught me a lot of things, from his personal life, to why he does art. We share some things in common which come from his background. This experience is definiantly one I will not forget. Aziz Al- Mudhaf is a true inspiration. The love he was reflecting on to the artwork was reflected back to us as the audience. 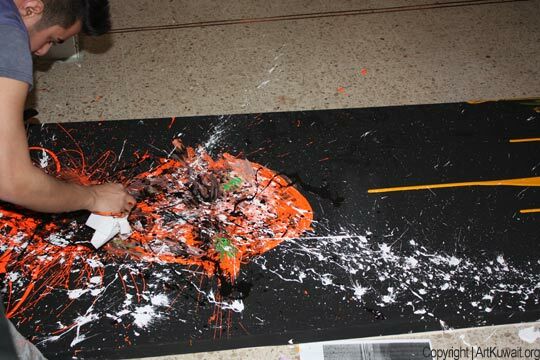 Having him come to our school and create an artwork infront of us was amazing! The only words that would come out of my mouth were “WOW, WOW, WOW” Not only did he inspire me to become a better artist but he also inspired me to become a better person. He taught me that even though some people might not always support our passion, doesn't mean we should just stop. Always do what you believe in because no one knows you as YOU know you. This experience was truly and deeply my first experience that i will never forget and probably not have the chance to come across again. Thank you Aziz for being who you are, and inspiring us to become better artists and better believers! P.S. THANKYOUU Mrs.Hani so much for making this day happen and allowing it to be awesome! 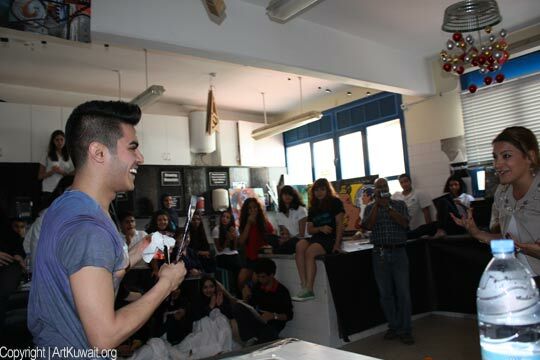 When Aziz came to our school on Wednesday 23rd, you could feel the vibe in the room. Everyone was so intent and ready to soak up his styles. The style of painting Aziz uses is amazing and shows how specific detail can be shown through numerous layers of paint. My favorite quote from Aziz that afternoon was when he said, “Don't let the people who are negative about your art affect the way YOU create it, prove them wrong.” (Aziz Al-Mudhaf) Thank you Aziz for taking the time out of your day to create an amazing artwork in front of us. 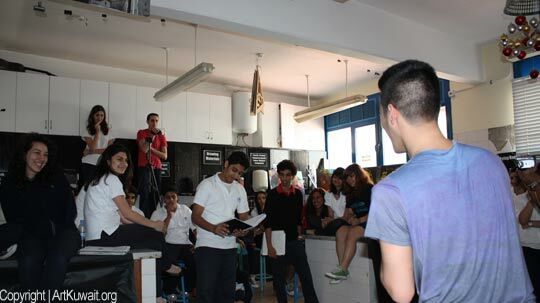 And thank you Mrs. Hani for inviting Aziz to the school and making the event happen. The experience was amazing! 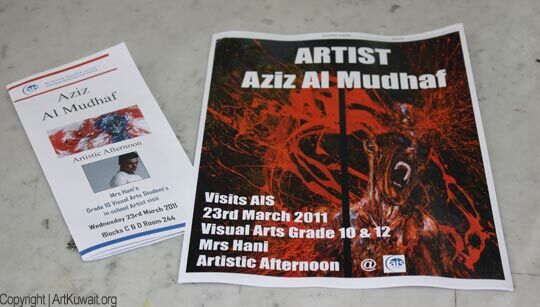 Having to meet a phenomenal artist Aziz Al-Mudhaf at AIS on Wednesday 23 March 2011 was a dream come true. It was a wonderful and an unforgettable afternoon. 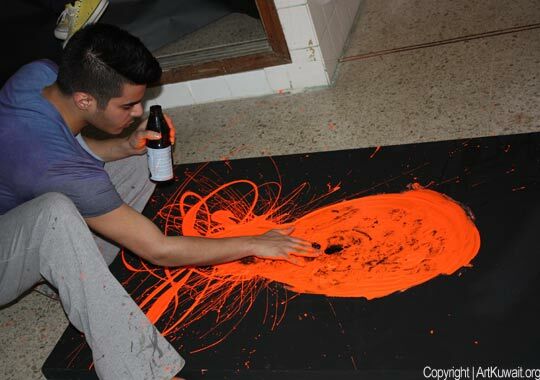 Aziz Al-Mudhaf is an amazing artist with lots of talent and a beautiful personality. He is a very open minded and honest person. He answered all the questions honestly regarding his life and his love to art. 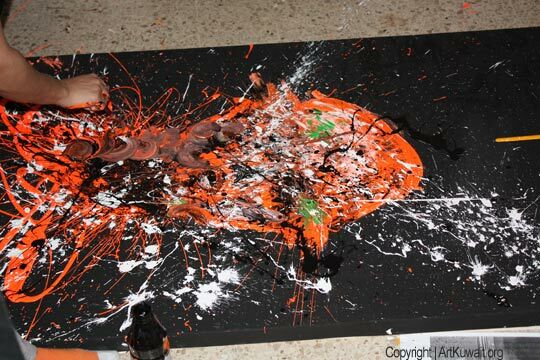 During the last hour of the artistic afternoon Aziz Al-Mudhaf has completed an unbelievable artwork using his hands. I have learned so many things that afternoon. I was able to understand that being myself self is better than having people telling me what to be; so believing in what I think is right will help me believe in my ideas and my talent in art. Aziz Al-Mudhaf not only has said it but he has proved it as well, while creating his incredible artwork. Aziz al-Mudhaf has made me understand how important art is and never to give up on it. I thank you Aziz so much for joining us and inspiring us with your great ideas and advise. I wish you the best in life and future career. 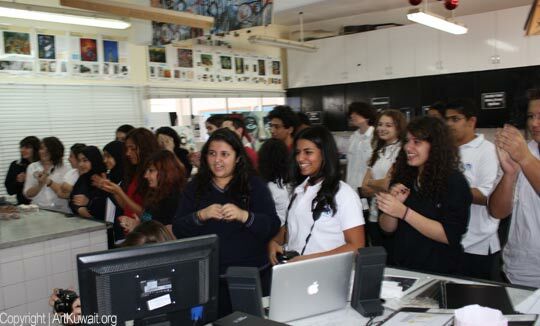 This day will never be forgotten in art with our amazing teacher Mrs. Hani. Thank you Mrs. Hani for making this opportunity occur. I have to say that the afternoon we spent with Aziz was truly inspirirational. Standing right in front of an emerging, talented and ambitious artist, listening to him talk, and watching him create art is beyond words. I have to say that I learned tremendously from this experience, and every little thing that Aziz said is going to help me grow, develop, and mature as an artist. He has taught me the importance of being the artwork when creating art, to put forth as much life and sincerity, as well as to create art the way you interpret it. Being able to take a path in life with no support whatsoever expresses the amount of perseverance, determination, as well as passion that he as an artist holds. Never before have I seen an artist create with his two bare hands, creating such gestural, lines forming a rhythm and harmonious effect. The amount of lines at different direction, as well as the amount of texture he created builds up a meaningful, magnificent artwork. One could directly tell how he was living every moment of it due to the focus and the control he had over the large canvas. Just watching him gave me Goosebumps. I enjoyed every moment, and I truly believe that this was a once in a life time experience. Thank you once more Aziz. Last Wednesday, on the 23rd of March, everyone walked around with a spring in their step, we were all excited to see Aziz personally, it was a once in a life time opportunity. The excitement was worth it. Listening to Aziz answer questions about his art and his struggles to get to the amazing stage he's at now is so inspiring, then seeing him paint live was even better. 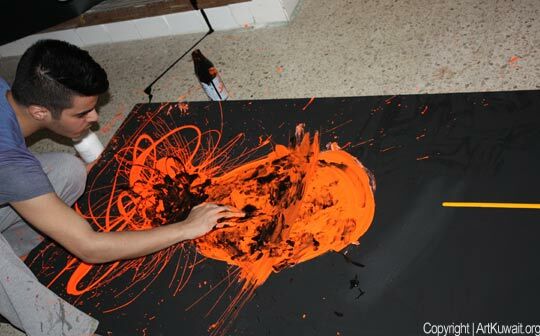 Especially because he created an amazing artwork using only his hands in less than an hour. Watching him was truly an experience im never going to forget, thank you so much for coming to see us! I really dont know where to start. First of all it was an honor and my pleasure having the artist Aziz Al Mudhaf visit us at AIS. I never thought that I would meet an artist! It was like a dream come true for me. I personally think that Aziz Al Mudhaf is a famous and inspirational artist, thats why I was looking forward to meeting him. The questions asked by us (students) made me know more about Aziz, whether it was his obstacles, experiences, and goals. His advices that were given in his speech made me think deeply about art, and gave me more tips about art. Whats unique about Aziz is that like he said he doesnt use a paint brush for his paintings, however he uses his fingers. The main thing I learned is while painting, the more movement the artist makes around the piece of art, the fancier the artwork will be. His painting me love art even more. I appreciate the fact that Aziz attended AIS and gave us an amazing speech, also gave us a chance to meet him! Thank you Mrs.Hani for bringing him and thank you Aziz for visiting us! Being introduced to Aziz Al Mudhaf prior to his arrival at our school was normal, it felt like just another artist study. However, when i entered the class room to find Aziz it felt different; he was different. He had his own style and sense of personality. Aziz was a great inspiration. I found him as a person who let nothing stand in the way of his dreams. 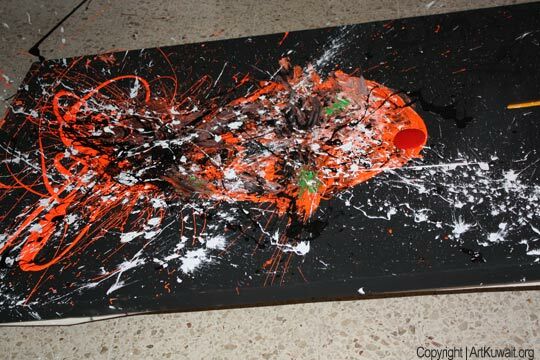 He loves art, and went forth with creating different and expressive pieces. The segment of time that Aziz answered our questions felt like an honest & open discussion he had now pressure and accepted all questions; answering them honestly… I learned from Aziz that one should not follow except his path, and admire the things he loves most. A true artist will only do what they see to be right.. And most importantly to do what you like and not what other people expect from you. I thank Aziz for putting aside his work and coming to visit us, and I also thank Mrs. Hani for putting together such an event. It was a once in a lifetime chance to see an artist in action, and it was an amazing experience! The fact that Aziz answered all the questions honestly had an even bigger influence on the students, it showed them to not be afraid of your background and of who you are. Aziz said that his family wasn't supportive whatsoever of his style for art. He still didn't let that stand in his way, and I found that remarkable. The artwork Aziz has made is amazing, not only because of the way it looks, but also the way he created it. 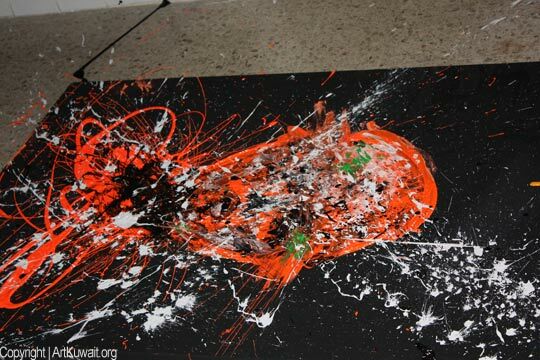 He has never used the type of paint he was using, and so he decided to experiment with it. Also, Aziz doesn't use brushes a lot. 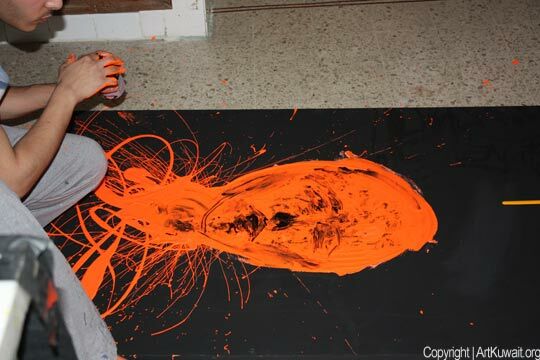 He likes to use his hands, and I don't blame him, because in the end, it's an amazing artwork. He also doesn't plan out his artworks, and I personally think that's a pretty cool way of working, because when you plan out something, you have to follow it so it can turn out as you wanted. However, if you just go ahead and spill all of your feelings onto a canvas, then that's more artistic, more of your style, and more of YOU. I love the fact that he listens to music as he works on his artworks, because that makes him think more, and it gets him more into the zone. Thank you, Aziz, for coming to our school. Now we have a unique story to share. Defining Wednesday the 23rd of March into one paragraph is challenging, but I'm going to try my best. As soon as we met the famous artist Aziz AlMudhaf, you can automatically feel reality into his words which reflect his artworks. 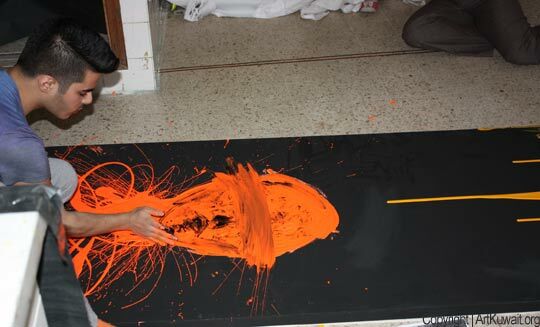 Kindly, Aziz had agreed to paint an artwork in front of us all with a matter of MINUTES. In the begging he was using bold and thick colors which I loved, and later on continued detail throughout the artwork. The inspiration and positivity Aziz spread throughout the day was just AMAZING. I think Aziz has drilled something so simple yet meaningful into each individuals mind. Do not stop doing what you love because others disagree, continue doing what you love until the people around you ADJUST to it. Define Aziz in 3 words? Amazing! Inspirational! Talented!!! WOW!!!!! What an honor for all of us it was to meet such a talented artist. I found this blog amazing and very entertaining, and is also one of the best that I ever seen. I loved this blog because it illustrates all the art news from Kuwait. 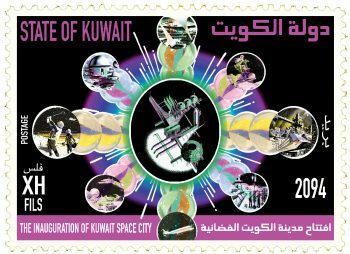 In this blog you can find a lot of information about Kuwaiti artistes and international artists, and also you can even check the upcoming art exhibitions and art events in Kuwait. Also, you can see the photo from art galleries based in Kuwait. Also, I liked this log because it evidence the importance of art in the life, and because of this, this blog gather the most important headlines from international art market and about middle eastern artistes. I was very impressed of this blog because it also has a lot of information and is very well organized. 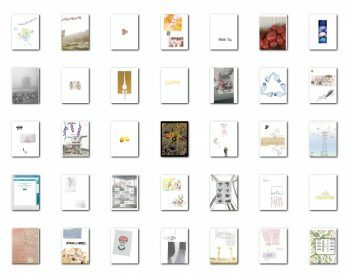 It is also nice to see many pictures on it. Wednesday, March 23, 2010 was truly an unforgettable day for me. It was my first interaction with a world-reknowned artist. 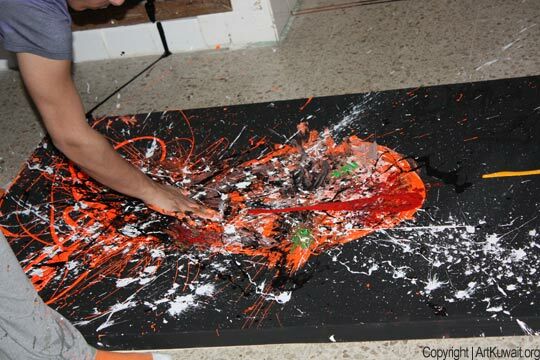 The event itself was an organized one that provided the students with a unique learning experience, and Aziz Al-Mudhaf with an environment that allowed him to discuss every topic with no hesitation; as well as paint an actual artwork in front of a live audience. I was interested to see how attending the prestigious JAMMART Festival in Dubai would impat the way he painted, and watching him perform exceeded my expectations. His use of bold colors and willingness to take risks inspired me and made him a bigger man in my eye. It was an inexplicable experience meeting such a character and i hope to do so again in the near future. Thank you Mrs. Hani for providing me with this oppurtunity. And thank you Aziz Al-Mudhaf for opening my mind to a world a never knew existed.